This is a hearty soup packed with flavor and lots of leftovers after the holidays. I love to make soups of all kinds, I never imagined how great cabbage went with split peas until now. This is a keeper for us. 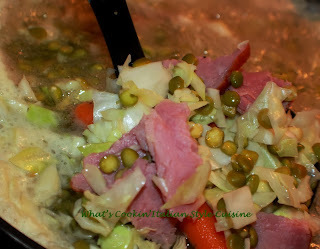 Very easy to make and we love simple throw together recipes like this one and the cabbage with ham really compliments the peas perfectly in this soup and very inexpensive to feed a whole family with a home cooked meal in one pot! NOTE: (I actually used a whole 16 ounce bag which makes a very thick rich soup fully packed with peas, if you want less peas or less thick of a soup I would cut it down to 2 1/2 cups) I had to keep adding water until they cooked and the soup gets nice and thick but fabulous! Option over ham: boil 2 boneless chicken breasts with the peas and it will make a great broth, then after the chicken is cooked cool, cut chicken up in small pieces and place back into the pot. In a 5 quart sauce pot, place the cleaned and sorted split peas in the pot fill with water leaving space of two inches from the top. Add the chopped cabbage, celery, carrots and ham and garlic powder. Simmer for around 1 1/2 hours (or more depending how much vegetables your adding) on medium heat adding more water when it boils down too much and until the cabbage and peas are soft. (I had to add water twice when using the whole bag of peas around to the same level 2 inches from the top of water at a time until everything was cooked soft.) The soup will thicken as it cooks down perfectly by the peas.